Have you ever suffered a computer break down and lost important data? If you are a music fanatic, I guess you can't afford losing music on iTunes library. Sure you can sync the songs back to iTunes library from iPod with iTunes but what about the playlists, rating, play records and other album information? 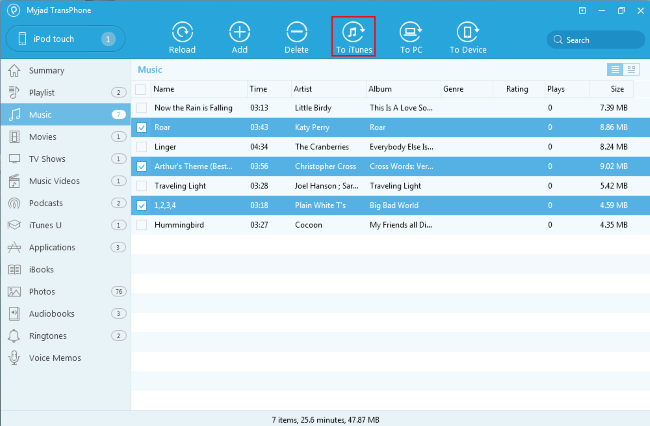 To flexibly export music from iPod to iTunes without omitting additional details, TransPhone does you a great favor. • Create, edit, merge, delete and transfer playlists between iPhone, iPad, iPod and iTunes. • Name, time, artist, album, genre, rating etc. all can be shifted completely. • Playlists can be played both on new and old iOS devices. • Support photos, videos, songs, apps of a wide range of formats. • Auto convert videos to Apple-friendly formats during migration. • Free transfer between iPhone, iPad, iPod, computer folder and iTunes. Are you the heart of the bursts of it? Then try to use it in trial version first! Run TransPhone and connect your iPod to computer. Soon the program detects songs on your device. 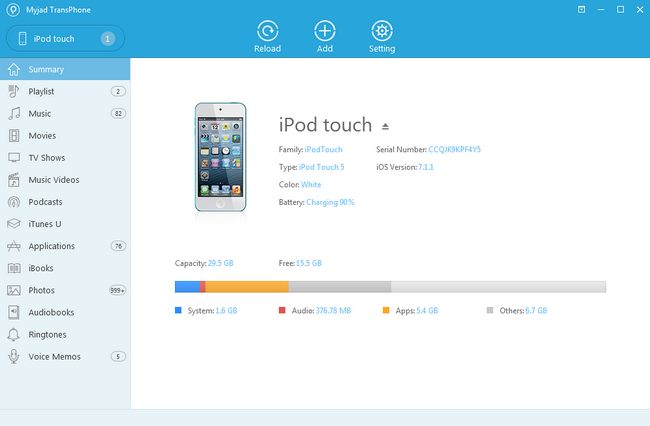 Look at this picture, and you can see the details of iPod such as color, name, battery and more with the different colors to describe capacity and Free space. Click on your device and the "Music" button you can see on the left side column. Select songs on the right side that you want to copy to iTunes library according to the name, size, time or other information. Then hit on "To iTunes" button which is located on the top margin. That's it! Simple and fast! You may also want to transfer photos,TV shows, podcasts, iTunes U, voice memos, music videos, applications, iBooks and more to iTunes. TransPhone supports all iPhone, iPad, iPod shuffle, iPod mini, iPod nano, iPod classic and iPod touch.